Capability Maturity Model Integration (CMMI) is a program designed to aid software development process improvement. This eBook analyzes CMMI, and offers valuable tips on implementing mature processes that comply with the requirements of CMMI. codeBeamer ALM can help you develop safety-related systems up to CMMI Level 2. 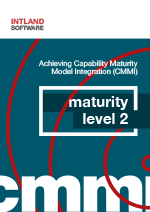 CMMI also serves as a model for assessing the process maturity of an organization, categorizing processes into the following maturity levels: Initial, Managed, Defined, Quantitatively Managed, and Optimizing processes. A certified (appraised) level of CMMI compliance (capability maturity) is required by many US and European customers especially in government and defense projects. While the basic (Initial) level of process maturity is characterized by poorly controlled and thus unpredictable processes, higher levels of process maturity mean a stronger control over processes. To achieve higher levels of process maturity, reactive processes have to be replaced by proactive ones, processes need to be controlled and managed, and finally, a focus on process improvement has to be achieved. While CMMI Level 5 is explicitly targeted at large organizations, Levels 2 and 3 are achievable by smaller organizations. For them, achieving compliance with these levels could mean new opportunities as they will be able to bid on projects where an appraised level of CMMI is mandated. codeBeamer ALM offers an array of features that facilitate the achievement of higher levels of capability maturity. In this whitepaper, you’ll find valuable information on how codeBeamer can help you achieve CMMI Level 2, thus realizing cost savings, process improvement, and eventually, higher quality software.